Julia Bryan-Wilson has been awarded the 2018 Robert Motherwell Book Award for her book FRAY: Art and Textile Politics (The University of Chicago Press). The award carries a prize of $10,000. 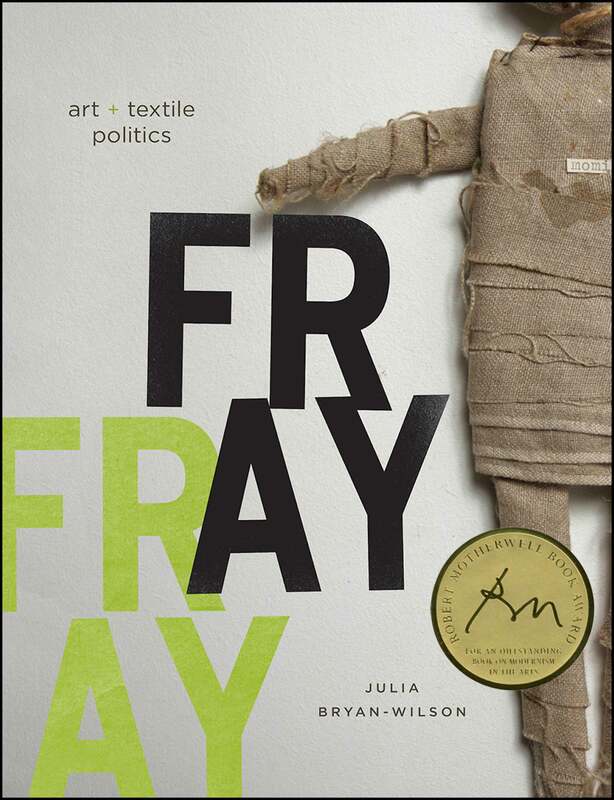 Julia Bryan-Wilson's FRAY: Art and Textile Politics closely examines how amateurs and fine artists in the United States and Chile turned to sewing, braiding, knotting, and quilting amid the rise of global manufacturing. Professor Bryan-Wilson argues that textiles unravel the high/low divide and urges us to think flexibly about what the politics of textiles might be. Her case studies from the 1970s through the 1990s—including the improvised costumes of the theater troupe the Cockettes, the braided rag rugs of US artist Harmony Hammond, the thread-based, politically charged sculptures of Chilean artist Cecilia Vicuña, the small hand-sewn tapestries depicting Pinochet’s torture, and the NAMES Project AIDS Memorial Quilt—are often taken as evidence of the inherently progressive nature of handcrafted textiles. Fray, however, shows that such techniques are often recruited to ambivalent ends, leaving textiles very much “in the fray” of debates about feminized labor, protest cultures, and queer identities; the malleability of cloth and fiber means that textiles can be activated, or stretched, in many ideological directions. FRAY is the first contemporary art history book to discuss both fine art and amateur registers of handmaking on such an expansive scale. It provides crucial insights into how textiles inhabit the broad space between the opposing poles of art and politics—high and low, highly skilled and untrained, conformist and disobedient, art and craft. Julia Bryan-Wilson is Professor of Modern and Contemporary Art at the University of California, Berkeley, and Director of the Berkeley Arts Research Center. She is the author of Art Workers: Radical Practice in the Vietnam War Era (California, 2009); and Art in the Making: Artists and Their Materials from the Studio to Crowdsourcing (with Glenn Adamson, Thames & Hudson, 2016). With Andrea Andersson, she curated the exhibition "Cecilia Vicuña: About to Happen."